Armenians had an important participation in the Soviet army during World War II. One of the most remarkable names in the Soviet air force was Nelson Stepanian. Stepanian was born in Shushi (Artsakh) on March 28, 1913. He moved to Yerevan with his parents shortly thereafter and attended Maxim Gorki School. He was a fifth grader when he got interested in aviation and aeromodelism. He won competitions of aeromodelism in Moscow, Kiev, Tbilisi, and Baku. In 1932 he graduated from the Sergo Orjonikidze preparatory military school of Baku, and three years later finished the school of Military Aviation in Bataysk, where he worked as a flight instructor until 1938. He continued his service in the city of Mineralniye Vodi, in the Northern Caucasus, until 1941. On June 23, 1941, the day after Germany invaded the Soviet Union, Stepanian was called to service in the offensive aviation of the Black Sea fleet. He entered the 46 th attack squadron and got familiarized with the Il-2 fighter, participating in the defensive combats in Poltava, Zaporozhye, and Odessa. He was wounded by shrapnel flak in his twentieth sortie. In August 1941 Stepanian was transferred to Leningrad (now St. Petersburg) as a member of the second air squadron of the 57 th division and participated in the defense of the city. He was designated ring commander. By decision of the Presidium of the USSR Supreme Soviet, on October 23, 1942, he was decorated as Hero of the Soviet Union, and in November of the same year, Capt. Stepanian became commander of the squadron of the 57 th Assault Regiment. As of November 1942, he was reported to have destroyed 78 German trucks, 67 tanks, 63 anti-aircraft guns, nineteen mortars, 36 railroad cars, twenty merchantmen and warships (including a destroyer), thirteen fuel tankers, twelve armored cars, seven long-range guns, five ammunition dumps, and five bridges. After he was promoted to the rank of major in 1943, he became the commander of the 47th Fighter Division. He executed about 60 battle flights in the positions of Leningrad and destroyed, together with his men, eight tanks, some 90 vehicles, and more than 60 cannons and machine guns. During the Crimean offensive in April 1944, Stepanian became commander of the 47 th air battalion, which was fighting in Crimea and Kuban. Under his command, the battalion participated in the fights near Feodosia, Sebastopol, and Sudak. On April 16, 1944 Stepanian, who headed a group of 12 Il-2 fighters, had personally destroyed three landing barges. He participated in the elimination of a German convoy on May 22, although his plane suffered important damage. Prior to the offensive, the 47th Division had destroyed 8 transports, 12 barges, 9 patrol boats, and more than 3,000 soldiers and officers. In May 1944, after the liberation of Crimea, Stepanian returned to the Baltic Sea with his 47th Fighter Division, where they were involved in the battles of the Gulf Finland. He was awarded the Order of the Red Banner on July 22. Stepanian was posthumously awarded the Hero of the Soviet Union title for a second time for his sacrifice. 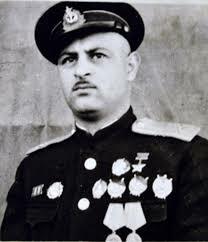 According to Soviet sources, Stepanian undertook no less than 239 combat sorties, sunk 53 ships (thirteen alone), destroyed 80 tanks, 600 armored vehicles, 105 cannons, 130 machine guns, 27 aircraft, and 5,000 soldiers. Four statues of Stepanian were inaugurated in Liepaja, Yerevan, Stepanakert, and Shushi. The latter was destroyed by Azerbaijanis during the Gharabagh war. The statue of Liepaja was moved to Kaliningrad in the 1990s. Stepanian’s name is also remembered by school No. 71 of Yerevan, named after him on the tenth anniversary of his death in 1954.